What does it take today to create the next hit musical theater show? What are the critical must have elements? An original and unique story? An unforgettable score? Outstanding performances from talented actors? Or even the 'wow' factor such as Phantom's chandelier, Miss Saigon's helicopter or Spiderman's aerial stunts? What is the magic formula that distinguishes one singular sensation from the rest of the line-up? James Kernochan, who works at Idiom Entertainment Capital, comments: "There are many potential variables in what makes a show successful, but I think one of the most consistent elements of a hit is that it draws upon the specific strengths of live entertainment -- it provides a fresh experience audiences wouldn't get at home." 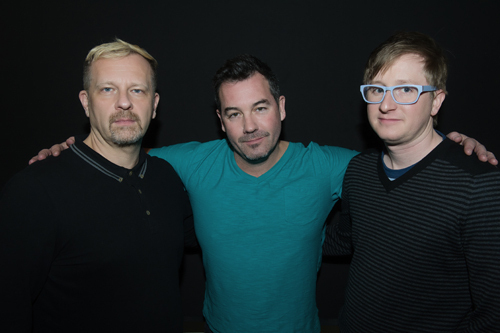 Three people who ought to know quite a bit about the process of creating successful musical theater shows -- Duncan Sheik, Grammy and Tony award winning singer-songwriter and composer, whose musicals include Spring Awakening (Two Tonys and a Grammy), American Psycho, The Nightingale, and Nero; Kyle Jarrow, OBIE Award winner for A Very Merry Unauthorized Children's Scientology Pageant, and writer of other plays including Hostage Song, Love Kills, and Gorilla Man; and Perrin Manzer Allen, Artistic Director of Joop Van Den Ende Academy and creator of numerous musical works -- are currently working with a company of 8 student actors at the Academy in Hamburg together with a small creative team to flesh out the book (Jarrow) and score (Sheik) of a new work in development called Noir. I caught up with the guys to find out more about the art and science behind creating the next hit show. Perrin, how did the Noir workshop come about? Kyle and I worked together many years ago and reconnected on Facebook last year. 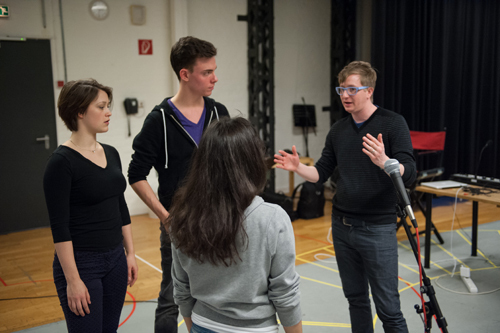 Also, I was the musical supervisor for the German Language premiere of Spring Awakening, and worked with Duncan on that show. It's a small world. I told Kyle about the Academy's curriculum and our interest in workshopping new pieces. He and Duncan talked it over and asked if they could bring Noir over. It's a great opportunity for our students to see how a new show is built, and so everyone benefits. Kyle, tell me about the title of your work, Noir. The show is inspired by classic film noir. It's an aesthetic I love and have long wanted to explore onstage -- not in a campy way, though there is definitely some humor in the piece, but rather embracing the moodiness and tension of the genre. Duncan and I also found inspiration for the show in the noirish radio thrillers of the 1930s and 1940s. In fact, we often talk about it as a sort of "live radio play." There's an onstage Foley artist in the show, providing a live soundtrack. He/she operates as part of the band, playing percussion in the songs, then creating sound effects during the book scenes. Integrating that element has been one of the focuses of this workshop in Hamburg. It's been working very well so far - actually better than I expected it to! Duncan, what's the music in Noir going to sound like? It's mostly electronic music with a few (more organic) art songs peppered throughout the show. But even the electronic songs are tempered by the fact that they began as exercises in genre songwriting. 50's and 60's spy movie soundtracks and vaudevillian show tunes were not absent from my thoughts during the songwriting process. Kyle, what inspired you to write Noir? It's an original story, which is admittedly a rare thing for a musical, but the plot is one I've been noodling on for awhile and couldn't get out of my head. Finally I proposed it to Duncan and he was into it. In addition to classic radio crime dramas, it draws inspiration from the movies Rear Window and The Lives of Others. The result is probably best described as a mash up of thriller and love story. It's about a lonely person who starts living vicariously through others, finds himself getting entrapped in a crime he doesn't understand... then ultimately reaches a sort of redemption through it all. What do you hope audiences will connect with? Kyle: At its core, this is a story about how love changes over time. There's a bittersweet melancholy to this theme (obviously! ), which Duncan's music does a beautiful job of supporting. The hope is that the emotion of that theme + a twisting thriller plot + great tunes = something unique and exciting for audiences. Perrin: The other elements that Kyle and Duncan are pursuing -- a live Foley operator providing onstage sound effects, or live beats mixed into the musical structure -- are definitely offering other unique opportunities. And, the juxtaposition of Duncan's music with this subject matter also is quite special. "There are a wealth of opportunities for new works outside of New York. 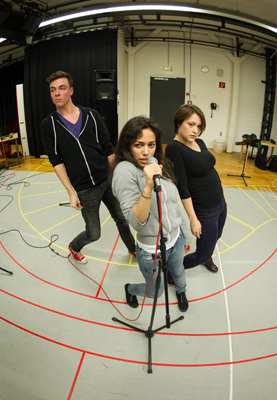 European theaters gladly present new work, and are invaluable as a resource for authors." Duncan, you've created for London audiences and American audiences - how are they different and will Noir work for both? If I were to make an absurdly ridiculous generalization, I'd say that the Brits are more interested in the theater of the head and Americans are more interested in the theater of the heart. Of course, I'd be happy for Noir to work for any audience but I don't really write for a specific set. I just try to write songs that are interesting to me because of their aesthetic uniqueness and hope that other people are also excited or moved by them. Writing a hit song for a musical theater show versus writing a hit pop song - what's the difference? They are not hugely different. However, you have much more opportunity to write from the perspective of a character other than yourself in the theater, and that has been very fun and rewarding for me creatively. How important is the process at the Academy workshops, in terms of developing the story telling? Kyle: The workshop has been incredibly helpful. We've done substantial rewriting and a ton of work to integrate the text, the music, and the Foley. One of the most surprising things for me has been the benefit of working with actors for whom English isn't their first language. They're all fluent, but their instincts are often different -- in terms of intonation, inflection and intent -- from what American actors would do on first blush. It allows me to hear the lines differently than they sound in my head, and it's forced me to be very honest with myself about what dialogue works and what doesn't. What are the next steps after the Academy workshop? Perrin: The information gleaned from the workshop will be integrated into the script and score, and probably the next big step would be a staged reading in front of potential backers. What are the opportunities for new shows outside of Broadway at the moment? There are a wealth of opportunities for new works outside of New York. And as a child of 1970's US, I grew up thinking it was Broadway or nothing. When I started working in Europe in the early 90's, however, I began discovering all of the opportunities that allowed themselves here. As a rule, European theaters gladly present new work, and are invaluable as a resource for authors. In England, the network of regional theaters and the large national theaters in London allow opportunities for development and production. 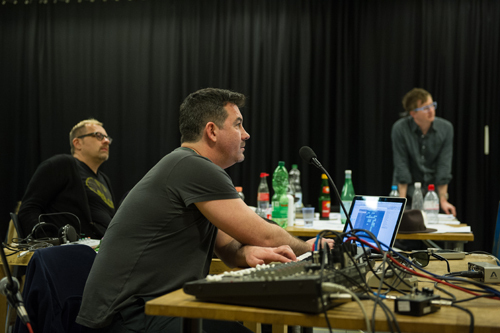 And though there may be drawbacks to the subsidized theater systems of the German speaking countries, these systems do provide unparalleled opportunities to explore and present new works in a low-risk setting. Play writing and musical theater writing is flourishing, and there are good and great pieces being developed around the globe. And while few of these pieces make it to Broadway, in our globalized world, the innovations that happen on the other side of the world no longer take years to cross-pollinate. It maybe takes a season or less now. Duncan, with the decline of the old revenue models in the recording industry, what would you say to a young artist who wants to make a good living writing music today? Getting signed to a label isn't what it used to be but I don't see that as a bad thing. Obviously, money is still being made by performers and songwriters - though often the money is made from licensing to film, TV or advertising, or doing things like, God forbid, musical theater. All that said, the only thing that matters is to make a piece of music that someone hears, and in hearing it, the music transports them to a better place - maybe even a really beautiful place where the whole world seems rich and full of possibility. Sometimes that happens, you know.